Photo by Chris Bosak Tufted titmice gather near a container with coneflower during November 2018. Scenes like this are quickly fading as winter starts to creep into New England. These coneflowers have lingered into late fall because I purchased them at a box hardware store on clearance a few weeks ago. I’m hoping the flowers return next year, but until then I’m enjoying their later-than-usual blooms. The birds are, too, of course. 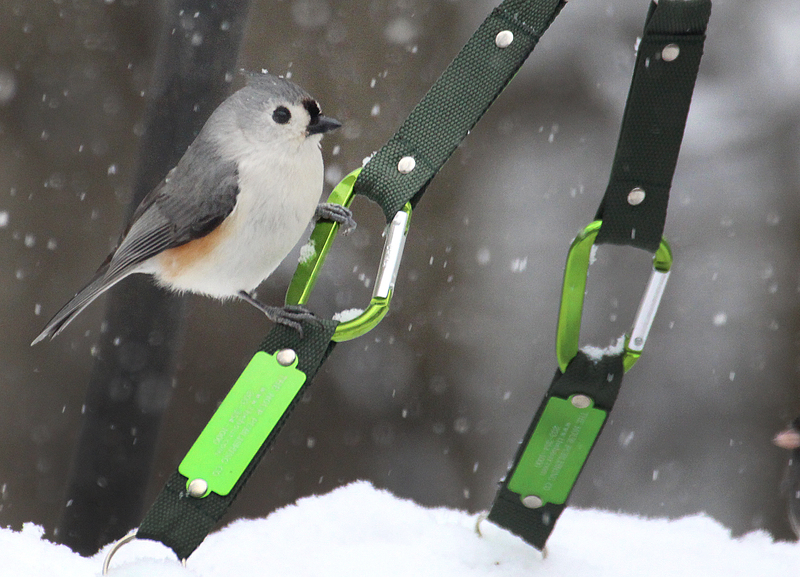 A tufted titmouse perches on a carabiner that holds up a homemade platform birdfeeder in Danbury, Conn., during the winter of 2016-17. Just another leftover winter photo. 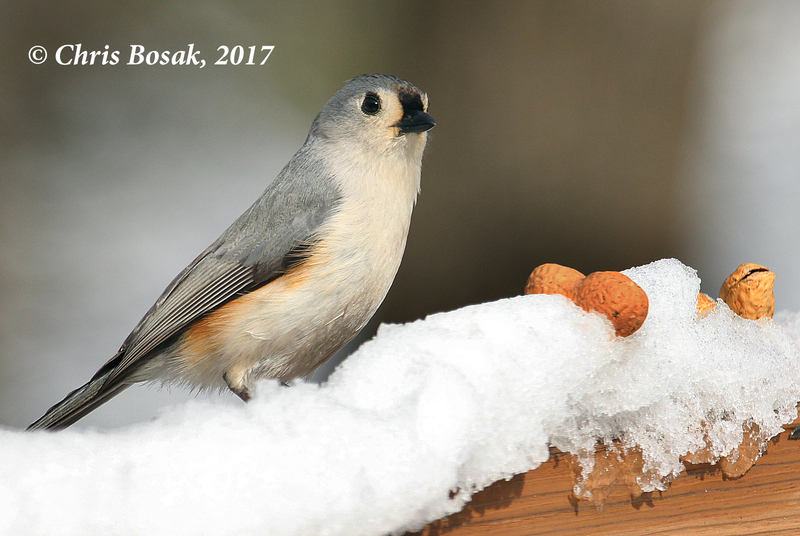 A tufted titmouse contemplates grabbing a peanut from a deck railing following a snowstorm in Danbury, Conn., Feb. 2017. Here’s another leftover snow shot from last week’s storm. 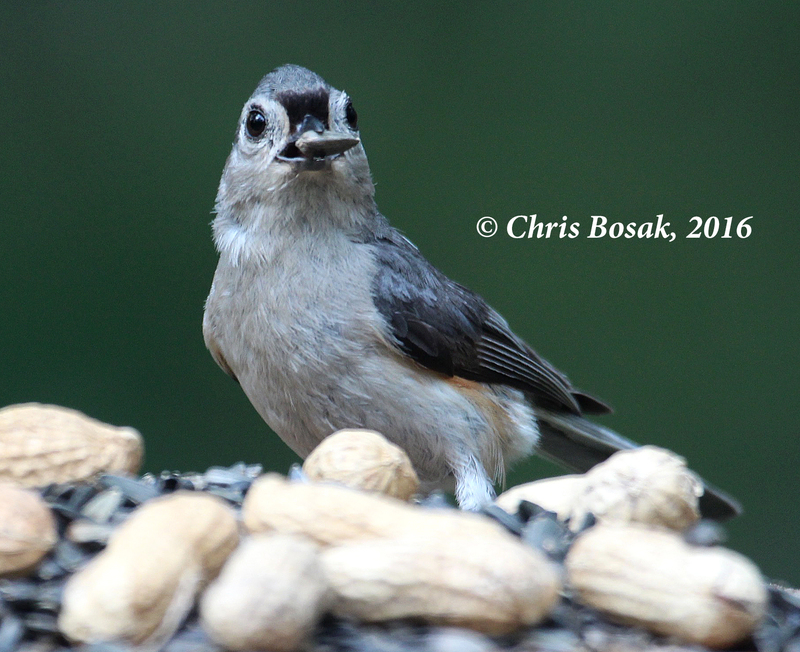 Titmice were the second-most reliable sighting in the backyard during and after the storm(s). Junco was the best most reliable with dozens in the backyard at any given time. A Tufted Titmouse tries to figure out how to pick up a peanut off a deck railing in Danbury, Conn., in the fall of 2016. I am entertained by birds doing just about anything, but one of my favorite sights in the backyard is watching birds grab peanuts and fly off to store or eat them. I put a handful or two of peanuts on a platform feeder or on the deck railing itself and wait for the birds to discover them. 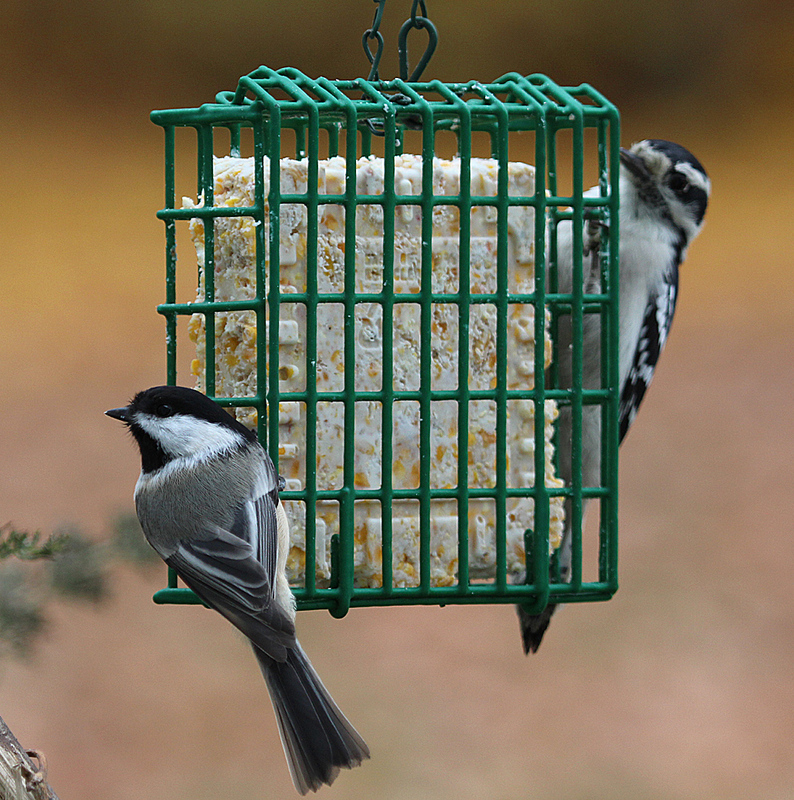 If the Blue Jays arrive first, forget it, the peanuts will be gone in a matter of minutes. Same goes for the Red-bellied Woodpecker. One or two of them empty the feeder in minutes, too. 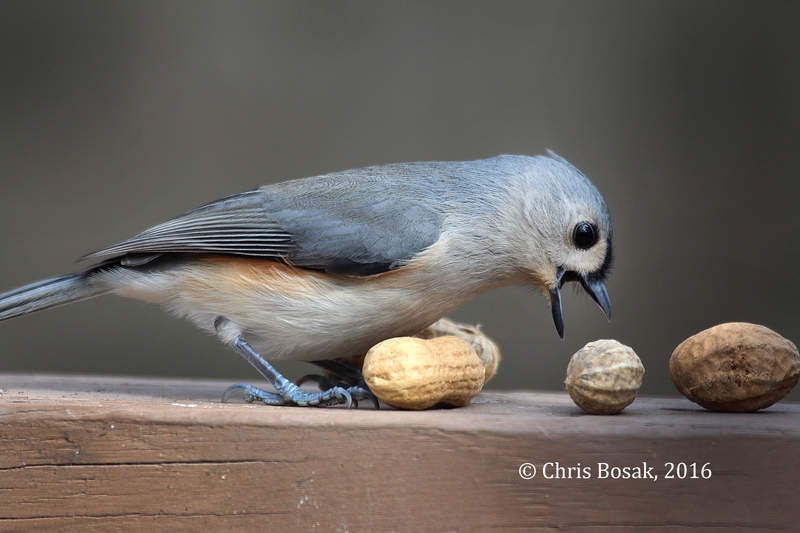 I like when smaller birds, such as the Tufted Titmouse above, go after the peanuts. Their bills aren’t large enough to simply fly in, grab the nut and take off. They need to pick the right peanut and position it just right to grab it. If you’ve never tried offering peanuts in the shell to birds, give it a shot. It has great entertainment value. A White-breasted Nuthatch checks out a new bird feeder in Danbury, Conn., March 2016. 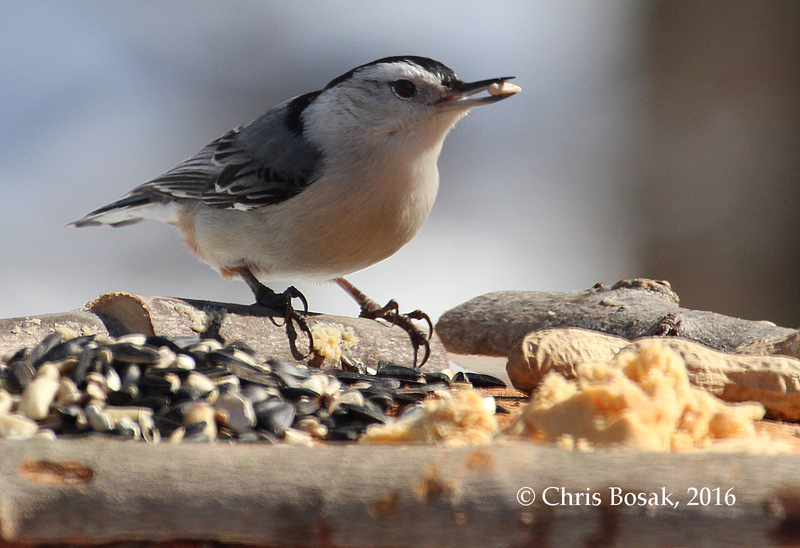 As promised, here are a few more photos of birds using the feeder that my 12-year-old Andrew and I made last week. Here’s the original story in case you missed it. More photos by clicking below.